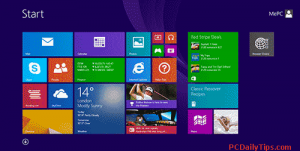 Disable Start Screen on Windows 8.1 and disable User Password Prompt. I have been using Windows Operating System based computers for years, and starting from Windows 8, this OS is completely different from the previous versions. I know there are pros and cons about it, but in my personal opinion, the Metro UI is just waste of time, if you need your computer more for productivity than for fun. Although the Metor UI is indeed a nice and fun features to play with, I want to go straight to my desktop whenever I open my computer or laptop in my case. So to achieve that, I need to Disable Start Screen on Windows 8.1 also to disable the password prompt whenever I login. 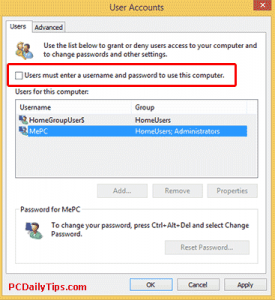 How to Disable Start Screen on Windows 8.1 and Disable User Password Prompt? 1. 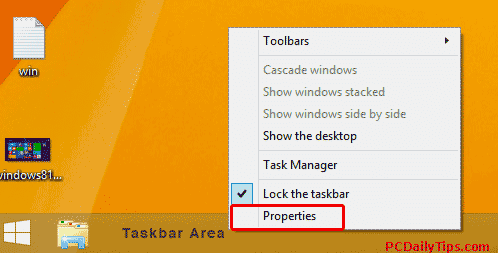 Go to your desktop, and hover, the Taskbar area on the bottom of your screen, and right click it. Select Properties. 2. 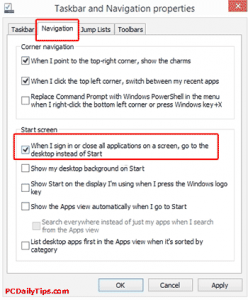 In Taskbar and Navigation properties dialog box, go to Navigation tab, and check the option off, where it says, “When I sign in or close all applications on a screen, go to desktop instead of Start”. Click, Apply, and Ok buttons. 1. 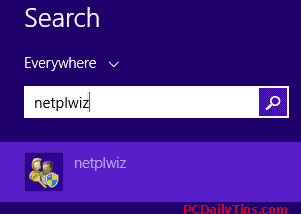 Hover the right top area of your desktop, that will bring your charmbar, and click the Search icon, and type, netplwiz on the search box, the User Accounts icon will appear, click it. If you’re interested how to change command prompt’s size, I posted a tut here. 2. In the User Account dialog box, select your User name, if you have many, and then, tick off the box which says “Users must enter a username and password to use this computer” option above. Click Apply, and OK buttons. 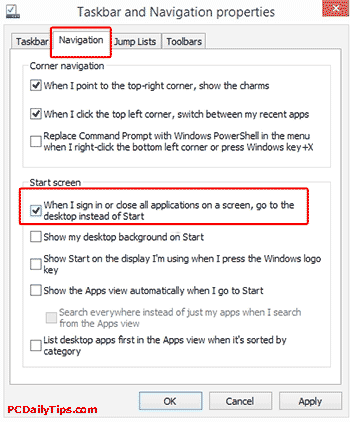 That’s it, we did already disable Start Screen on Windows 8.1 and the prompt to enter User password.